It seems like ages have passed since the release of Martin Dosh’s last solo record, 2010’s Tommy, but that’s only because the successive years have been a productive time for the Minneapolis multi-instrumentalist. In 2011 he released a tour-exclusive record called Silver Face (now available online) that illuminated his creative process, collecting a variety of discarded beats and musical sketches in various states of completion. In 2012, Dosh returned to the studio with longtime collaborator Andrew Bird, providing drums on Break it Yourself as well as the companion record Hands of Glory. He also demonstrated his straight-ahead rock chops, jumping behind the kit with the Minneapolis band the Cloak Ox for a pair of records. Dosh’s Facebook page was periodically updated with videos of improvised tracks he performed in his basement. Last February, he collaborated with Wilco percussionist Glenn Kotche, composing a 25-minute piece for a performance at the Walker Arts Center. In short, he’s kept busy. 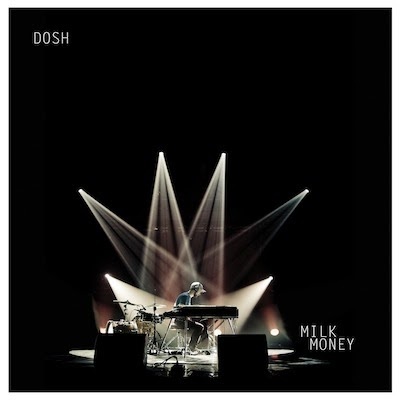 Amid all of his other projects, Dosh found the time to record his new album, Milk Money. According to the liner notes, he’s been working on it in fits and starts since January of 2011. It’s his first release for Graveface Records, marking Dosh’s departure from LA label Anticon, which has issued all of his previous solo releases. The album is also devoid of instrumental contributions from the likes of Mike Lewis and Jeremy Ylvisaker, who have fleshed out Dosh’s past three records both in the studio and on the road. Ever since he recruited members of Tapes ‘n Tapes and Fog to supplement The Lost Take in 2006, Dosh has seemed interested in finding ways to integrate additional players into his compositions. Nowhere was this more evident than on Tommy’s reimagining of “Call the Kettle,” (a song that originally appeared on Dosh’s 2005 Powder Horn LP) which showcased the taught interplay between Dosh’s looped creations and Mike Lewis’s malleable saxophone licks. Left to his own devices on Milk Money, Dosh explores the reaches of his own abilities as a drummer and keyboardist, creating tracks that reveal both the impressive depth and inherent limitations of this approach. Adhering to the self-imposed limitation of recording songs by himself, Dosh relies on an assortment of synthesizers in lieu of the guitars and woodwinds that have populated his past album. At times, this altered approach to composition results in tracks that are sleepy and listless (“20 Years”) or harsh and disjointed (“Unto Internity”). But elsewhere, Dosh finds the perfect balance between looped foundations and synthesized embellishments. On “Kisses, “ he builds a repeating phrase underpinned by undulating bass and pattering drums that flirts with sampled strings before dissolving into a melancholic, piano-driven breakdown. When Dosh is hitting his stride, the incessant repetition of his compositions is overshadowed by the (often unexpected) changes that propel each track. Milk Money closes with the 25-minute “Legos (for Terry),” an initially confounding track that lacks the momentum and structure of Dosh’s previous output. Inspired by the time that Dosh’s father spent as a Benedictine monk, the first half of the piece is calm and sparse; a seemingly improvised cascade of Rhodes and piano. At its halfway point, the song suddenly gains a rhythm as layers of marimba and drums take hold, gradually building to a pounding conclusion. Originally composed for a live performance, “Legos (for Terry)” is essentially an extremely drawn out version of Dosh’s usual song structure. By design, it sacrficies the energy of the more concise tracks that precede it, while offering a deliberate glimpse into Dosh’s creative process. As a representation of Dosh’s talents as a solo performer, Milk Money is a capable album; an appropriately diverse selection of tracks that build on his distinctive style. However, placed in the context of Dosh’s previous records, his latest often sounds like the work of an artist who is holding something back. For now, Milk Money embodies its origins, showcasing the possibilities and restriction that spring forth from self-imposed solitude. Perhaps next time Dosh will invite a few of his friends back into the fold.